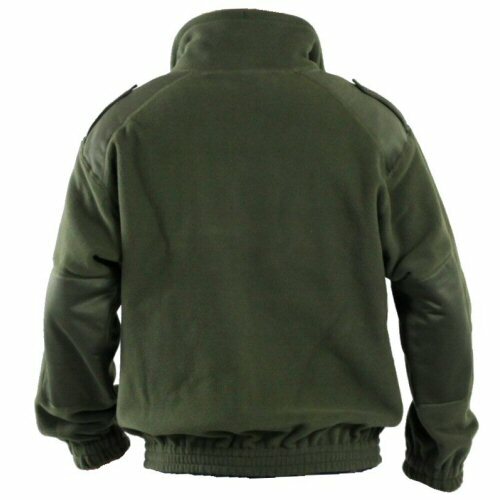 A soft and warm polyester fleece jacket in polar 380 gsm weight, military olive green colour, with a full front chunky zip, covered elastic wrists and waist, tall collar with adjustable neck to reduce draughts from the back of the head and under the chin. The fleece has two zip-up handwarmer pockets, and the shoulders and elbows are reinforced with nylon stretch material. 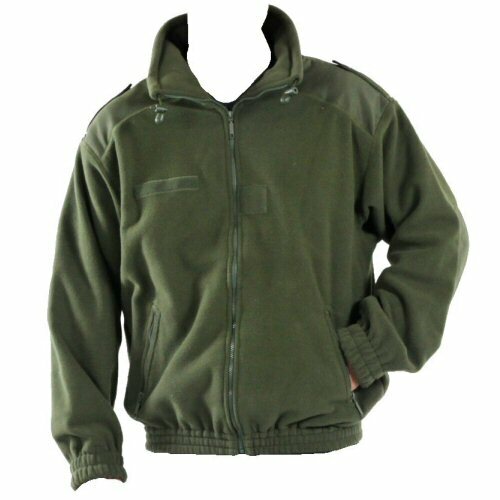 Two button up epaulettes are located on the shoulders in classic military styling, and the front of the fleece has velcro strips on the chest for velcro-on tapes and one on the front of the chest for commando-style rank insignia. Heavyweight fleece is great for keeping warm on the range, either as a mid-layer under windproofs or waterproofs, or as a country jacket on its own. Sizes 44in (112) chest, 48in (120) chest and 51in (128) chest, body height 5'10-6'0. Available options are: 112 , 120 , 128 . Rear of the jacket, showing the shoulder and elbow reinforcements.